Are you afraid of trying a new makeup style on your face or looking explore new kind of makeup styles? There are many beauty and makeup apps to help in these cases. We have tested several Makeup Apps and made a list of best makeup apps for Android and iOS. 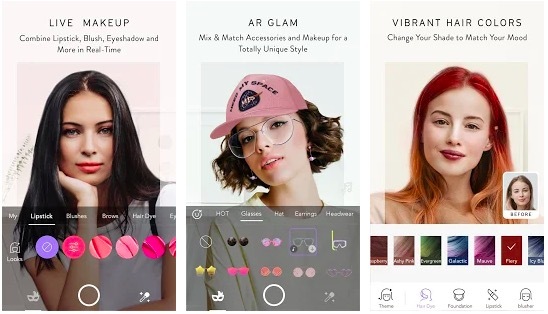 These apps offer AR to give you a real-time idea of how a makeup or beauty style will look on your face. You can try several kinds of makeups and hairstyles on your photos and see the changes in real time. When you are satisfied, you can apply that on your face for real. 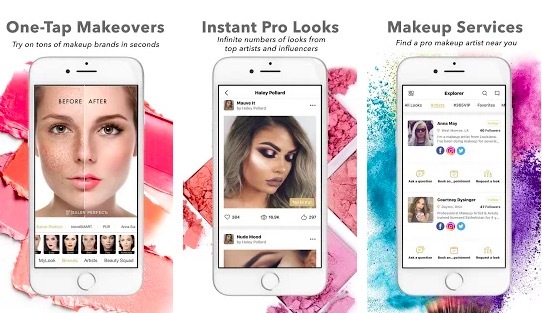 Few of these apps also connect you to professional makeup artists if you want. Here is the list of best makeup apps and best beauty apps for Android and iOS. Check the list, read the description and download one. YouCam Makeup is the most popular makeup app available for both Android and iOS. The app lets you check how a specific makeup will look on your photos. It uses Smart facial detection to show the makeup on your face in real time. The app also analyses the health of your skin and makes a score based on wrinkles, spots, acne and dark circles. The app has several tools for makeovers of eyes, brows, lips and getting a Flawless Skin. You can also try makeovers from the hottest celebrities. You can make your eye color shine, edit eyebrow style and choose the color of lipstick. Not just facial makeup, you can also try hairstyles. YouCam Makeup offers Live 360-degree hair coloring. It is a free makeup and beauty app with in-app purchases. You can download it from Google Play Store or App Store depending on the smartphone you use. 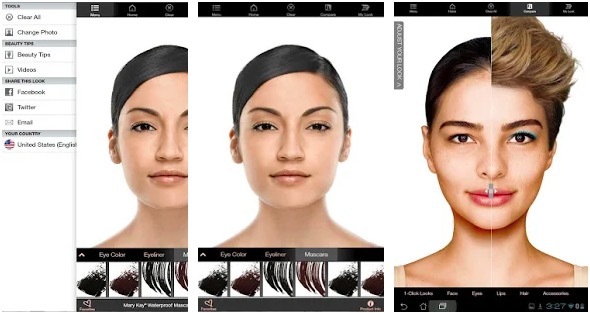 Perfect 365 is also a popular makeover app that offers full virtual makeup. You can use the app to change your style with tons of options available for face and hair. Many of these options are created by professionals. The app comes with more than 20 makeup and beauty tools to get a personal style. There are also more than 200 pre-set hotstyles to try on a single tap. You have unlimited custom color options. There are also video tutorials from YouTube artists for recreating the virtual looks on your face for real. In case you want a professional service, the app also lets you connect with a pro makeup artist near you. The app also offers Daily makeup and fashion tips along with Beauty and fashion product recommendations. Perfect 365 app is also free to download with in-app purchase option. 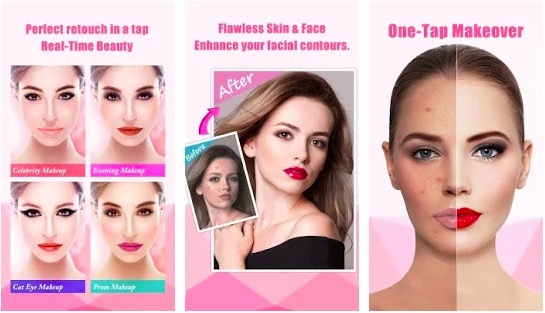 This makeup and beauty app is also available for both Android and iOS. MakeupPlus is also an excellent makeup app that lets you try several makeup tools on your photos. You can use this app to try makeup looks created by the beauty industry’s top professionals and see how a specific makeup will look on your face. By using the augmented reality (AR) camera., you can see how you will look after the makeup. You can apply lipstick, Blush, eyeshadow and see the effects in real-time. You can also try several accessories and even change hair color. You can even change the eye color by applying virtual contact lenses. There are lots of options available in the app to try. Mary Kay Mobile Virtual Makeover is also a good makeup app for iOS and Android. The app lets you upload your selfie and then use several makeup tools to add makeup on your face. You have a full range of makeup looks, hairstyles, nails, and accessories. You can create unlimited makeovers on your photos. There are several hairstyles and hair color combinations to choose from. You can customize your eye makeup, lip color, accessories and more. You can also download your makeover from the app or share it with your friends on social media platforms. This makeup app is also free to download for both Android and iOS. InstaBeauty is basically a selfie photo editor app that you can use to make perfect photos to share on social media. InstaBeauty, the makeup and beauty app, is available for both Android and iOS. It comes with more than 100 beautiful makeup styles and filters. You can use this app to remove whiteheads, blackheads, pimples, acne, and rosacea to get the flawless skin in your photos. The has one-touch option to beautify your photos. It also has the option for teeth whitening, change the shape of eyebrows and more. 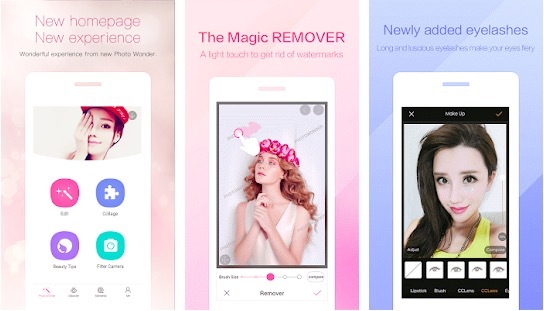 The notable features of the app include Beauty Makeup, Beauty Camera, Beauty Collage, Beauty Video, and QuickSnap. PhotoWonder is also an excellent beautify app that lets you turn an ordinary selfie into a professional photo by adding beauty and style using the available tools. The app comes with several camera filters that add effects on your photos in real-time to let you know how a style will look on your face. The app lets you adjust skin tones, cover dark eye circles and add makeup like blush and eyeliner. You can also slim your face if you want. There are also tons of trending frames and stickers to try. The Glam App is another good makeup up bright to you by renowned makeup artist and celebrity hairstylist Joey Maalouf and blogger/actress Cara Santana. This makeup app aims to bring beauty experts to your front door. It acts as a virtual agency that lets users connect with freelance artists. 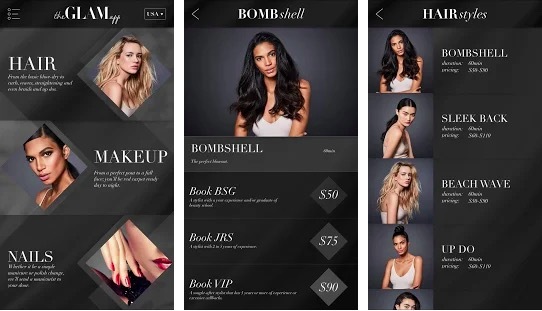 Stylists use this app to get clients looking for makeup and stylising services. The app is limited to only a few cities to the United States. So, check the list of cities on the app download page. If you live in any other country, you should look for other apps on this list. The reason for keeping this app low in this list is the bad user experience. Several users face issues in signing up or filling other information since the app was last updated. The app developers have yet to push new updates fixing the issues. This was the list of best makeup apps for Android and iOS. These apps offer lots of makeup and styling tools that you can try on your selfies. When you are satisfied, you can try that style for real. 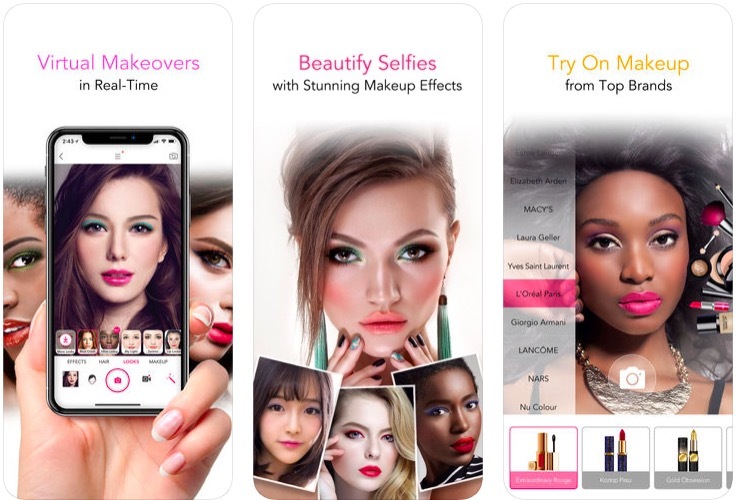 Few of these apps also have an option to connect with professional stylists to get that makeup done.